Do you have a aversion to math? Well then the 15" inch quilt block is a welcome choice as the patches are designed in divisions and multiples of fives for ease. An added bonus is that by making a larger block, your quilt will go together in no time as there are less blocks to make. I had fun with this Double Links quilt block. It is not a block for the average beginner, only because it contains so many pieces. But, if you look closely at the block, you will see that it contains mainly half square triangles, with a few three quarter square triangle patches added. These three quarter square triangles are so named as each square contains three triangles, of two different sizes. The smaller sized triangles in this patch are cut as quarter square triangles, using two of the four cut pieces per patch. The fun with this quilt block came with the design of the sample quilts illustrated. By rotating some of the blocks by 90 degrees, you achieve a different look (although it is subtle). 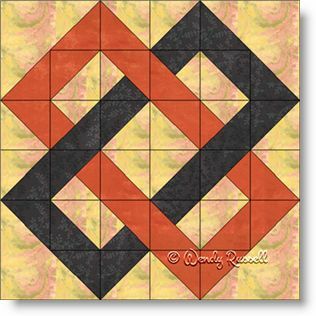 Using extra blank blocks in your design will allow you to feature your quilting skills. All in all, it is a wonderful choice for those up for a bit of a challenge, although with patience and precision a beginner could also master this quilt block. Let the stitching begin!